Cedrus atlantica the Atlas Cedar, takes its name from the Atlas mountain range of Algeria and Morocco. Originating in Northern Africa, this Cedar was brought to the UK in the 1840’s. Despite rapid growth when young, like all Cedars, one is planted for future generations to enjoy as it is ultimately a long lived stately old tree that takes many years to fully mature. An evergreen which broadens with age into a spreading, flat topped tree, C.atlantica ideally needs to be grown in a large open area where it can naturally develop its magnificent form and where there is space for it to be admired. Mature, it will grow to a height of over 20 meters. 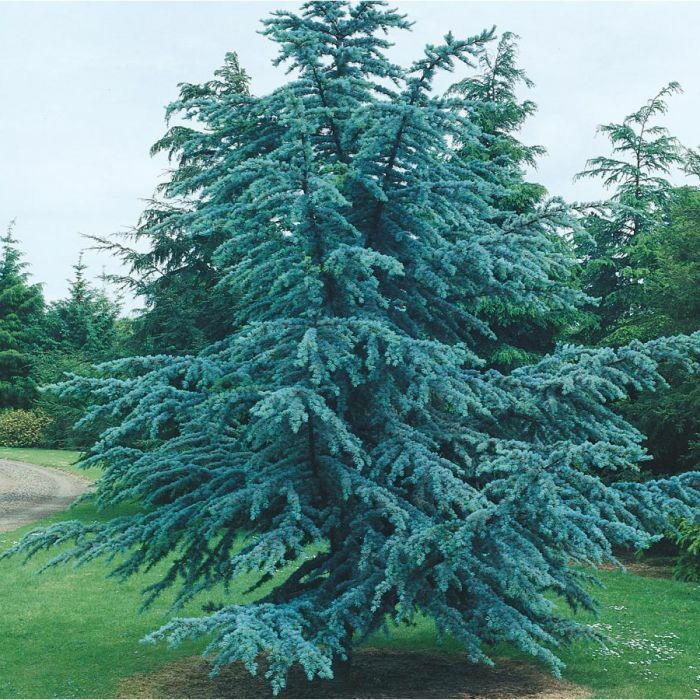 The Atlas Cedar has long silvery green foliage which is more noticeable as the tree matures and glauca blue cones 5-7cm. Cedrus atlantica is a robust tree capable of growing in a range of conditions so long as they are adequately drained. Also performs well in both sheltered and exposed areas and is the best of the Cedars for tolerating urban pollution. Requires very little maintenance. Fully hardy.